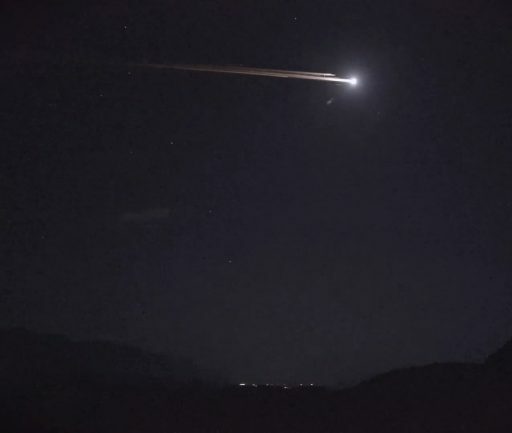 Authorities in the Western United States received dozens of calls Wednesday night and Social Media was a buzz after a long-lasting fireball streaked through the night skies from California to Utah. 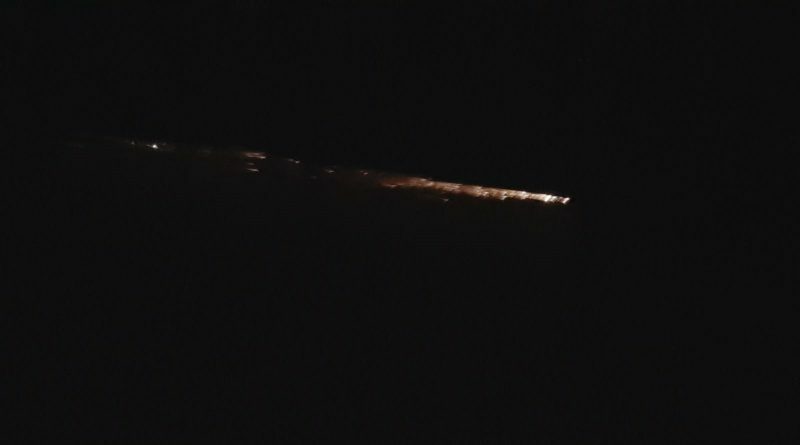 Data from the Joint Space Operations Center confirmed the event was caused by the fiery re-entry of a Chinese rocket stage that had spent one month in orbit. 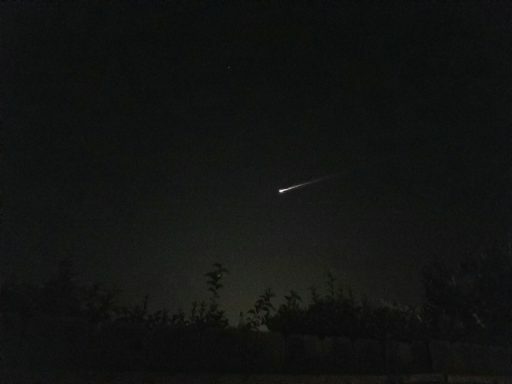 California residents reported seeing the bright object in the skies at 9:36 p.m. local time on Wednesday, 4:36 UTC Thursday and described the event as a slow-moving fireball breaking up in the sky. Videos of the event show the typical characteristics of the re-entry of a man-made object – moving much slower than any natural meteor and breaking up into individual fragments. Reports came from across California, dozens of videos were posted from Las Vegas and sightings were reported as far east as Utah. The fireball was visible for over 30 seconds from most locations. The object responsible for Wednesday’s light show in the sky was a spent rocket stage from the maiden launch of China’s Long March 7 rocket. The 53-meter tall rocket lifted off from China’s new Wenchang Satellite Launch Center, Hainan Island on June 25, carrying into orbit a prototype of the country’s Next Generation Crew Vehicle, a group of small satellites and a ballast mass that remained attached to the Yuanzheng-1A Upper Stage that completed a two-day free-flight for experiments ahead of a targeted re-entry. 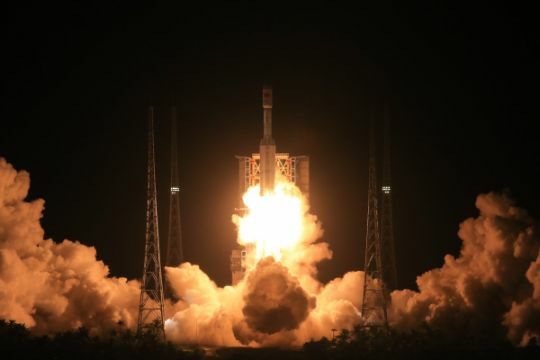 The second stage of the rocket reached an orbit of 201 by 379 Kilometers at an inclination of 40.8 degrees – beginning a slow descent toward Earth caused by drag due to collisions with atoms and molecules present in the very upper reaches of Earth’s atmosphere. 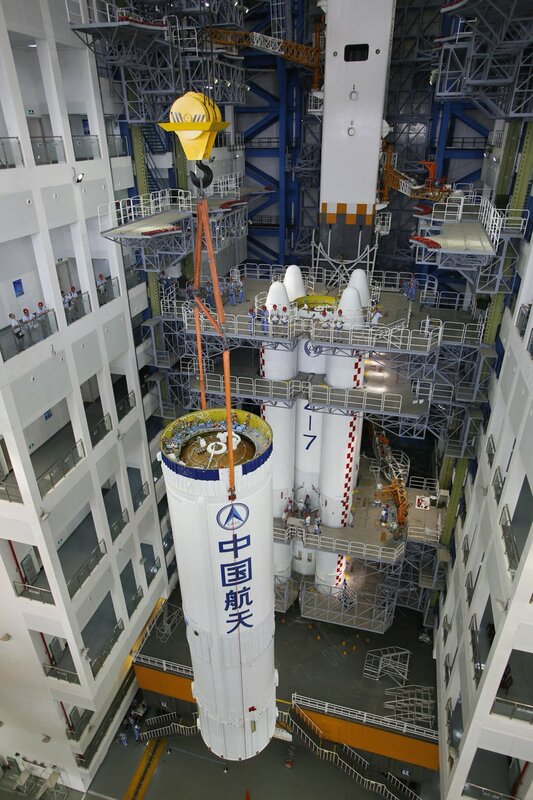 By Wednesday 12 UTC, the rocket stage had reached an orbit of 131 by 144 Kilometers. 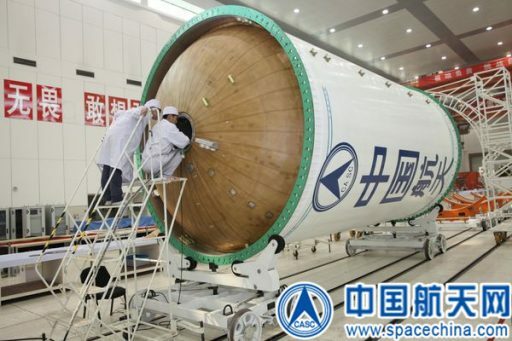 The second stage of Long March 7 is about 11.5 meters in length, 3.35 meters in diameter and weighs around six metric tons without fuel – making is a sizeable re-entry object. On its business end, the stage hosts a pack of four YF-115 engines that burned over 65 metric tons of Kerosene and Oxygen during the rocket’s climb into Low Earth Orbit. Rocket stages are relatively light and have a large surface area – comprised of large tank sections and the heavy engine compartment in the aft, causing a more rapid orbital decay compared to satellites that are more compact, offering less surface area for drag to act on. Flying over the Pacific Ocean – passing just south of Hawaii, the spent rocket stage was en-route for a pass from south-west to north-east, flying over California, crossing the coast south of San Jose and Salinas before passing north of Fresno and flying over Nevada, Utah and Colorado. The Joint Space Operations Center employs ground-based radar to track objects in orbit and pays close attention to objects close to re-entry. Missile warning satellites in Geostationary Orbit can sense the infrared signature of a re-entering object, allowing the position and timing of re-entry to be pin-pointed with great accuracy. 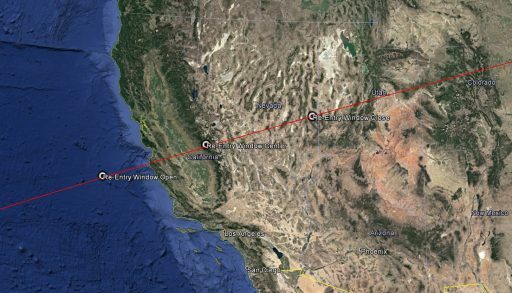 According to JSpOC, the Long March 7 Rocket Body re-entered at 4:36 UTC (+/-1 minute) near the California-Nevada border, however, the two-minute uncertainty window represents a 900-Kilometer track along which orbital decay took place. As plasma built up around the stage, starting around 104 Kilometers in altitude, it became visible as a small dot moving across the sky. Hitting the dense layers of the atmosphere, heat started building up on the stage and drag at the high entry speed of 7.8 Kilometers per second quickly built up to a destructive force, causing the rocket body to break apart. Due to the extremely high speed of the object at re-entry, air in front of the rocket stage is compressed, generating a shock wave layer in which molecules are separated into ions and temperatures reach the extreme. 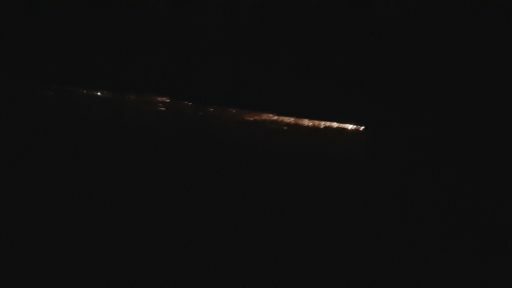 Videos of Wednesday’s re-entry show an initial liberation of smaller fragments before the principal object breaks into two and then several pieces, each with its own fiery tail. Some objects, likely the dense engines, pull out in front of the others and remain visible the longest. The Entry Point, defined by USSTRATCOM at an altitude of 80 Kilometers, marks the beginning of the disintegration of the object (+/-10km) due to drag building up to a destructive force, triggering the onset of fragmentation. The extreme deceleration of up to 20Gs is sufficient to crush structural components and the shock wave layer in front of any pieces of the rocket body leads to considerable heating that causes most parts to be fully incinerated in the upper atmosphere. Temperatures reached during re-entry can melt most metal types used on the spacecraft and most of the fragments created on entry fully burn up, leaving a cloud of dust in the upper atmosphere that sometimes shows up in weather radar images. Dense components such as spherical pressurant tanks and engine components can survive re-entry and reach the ground, illustrated by several pieces of engine debris and tanks found across the globe every year. 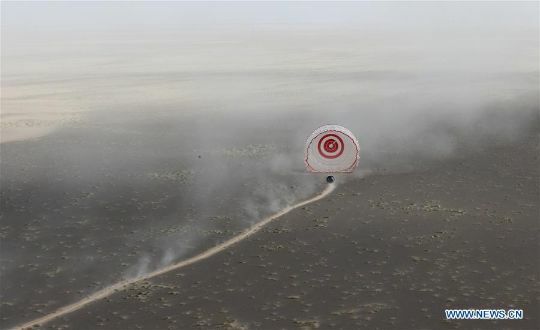 Components that survive re-entry usually impact 800 to 1,300 Kilometers downrange from the Orbital Decay Point – Atmospheric properties such as crosswinds play a significant role during atmospheric descent. Parts likely to survive re-entry include the combustion chambers of the YF-115 engines that are designed to withstand high temperatures and represent some of the most dense components on the rocket stage. During flight, the tanks of the stage are pressurized with Helium stored in small spherical tanks that have been known to frequently survive re-entry of Russian and American rockets. Assuming re-entry in the center of the two-minute uncertainty window would place surviving pieces along a stretch from North Central Colorado to southern Nebraska. 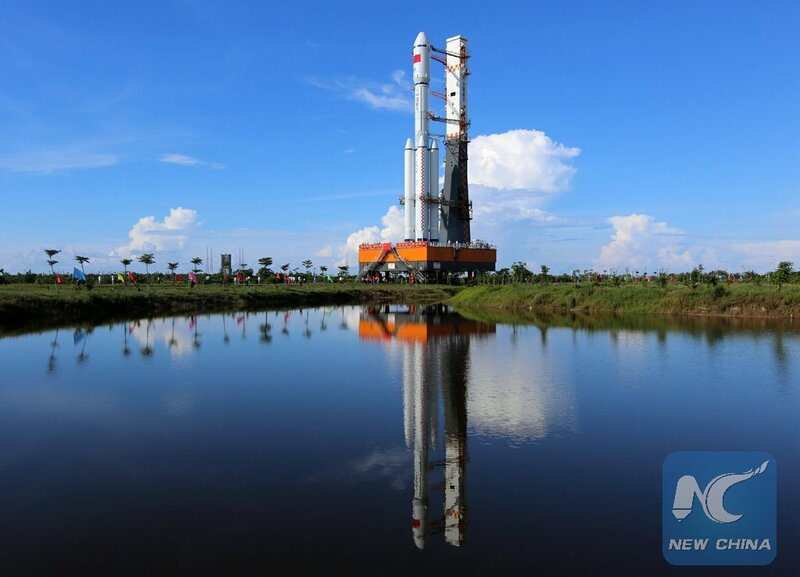 The maiden launch of Long March 7 marked China’s next major step in the introduction of modern launch systems to eventually replace the country’s current line of rockets, rooted in decades-old designs and burning a toxic and expensive hypergolic propellant mixture. 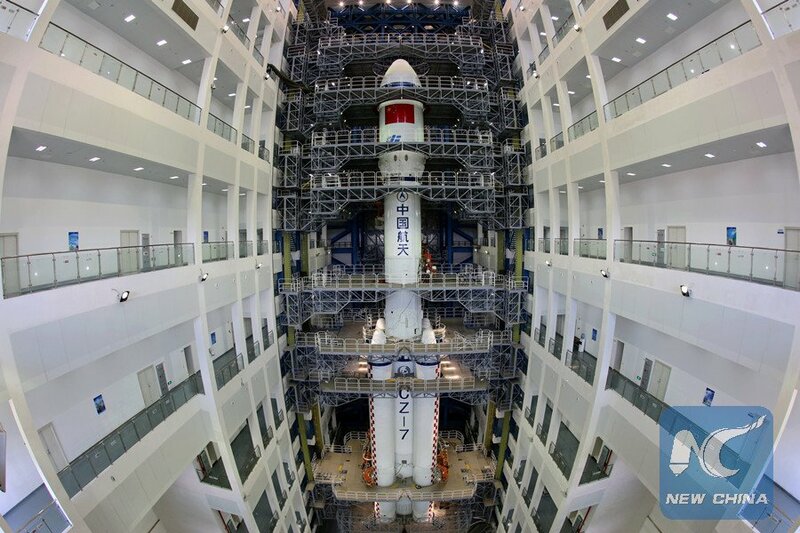 China’s new rockets rely on the concept of simplification through commonality – sharing a number of components and manufacturing technologies to streamline the production process in order to permit a large number of flights.